Choral Mauladia, a street vendor and trade unionist in Ahmedabad. Photo: Getty Images Reportage. Most of us do not realize how many people are employed in the informal economy and how much they contribute collectively to the urban and national economy. A new World Resources Report paper, "Including the Excluded: Supporting Informal Workers for More Equal and Productive Cities in the Global South," shows that informal workers are crucial to economies around the world—and urges new policy approaches to support them. Globally, informal employment represents just over 60 percent of total employment and nearly 44 percent of urban employment. In some cities of the global south, the informal economy employs 80 percent of the working population. In Mexico, informal workers make up 60 percent of the workforce and generate 30 percent of the country’s gross value added (GVA). In India, 36 percent of all enterprises are informal and home-based. Overall, estimates indicate that outside agriculture, informal enterprises generate one-quarter to one-half of GVA: 50 percent in countries in West Africa, 46 percent in India, 29 percent in the Middle East and North Africa (MENA) region, and 25 percent in Latin America. The informal economy is an integral feature of the economic landscape of cities. 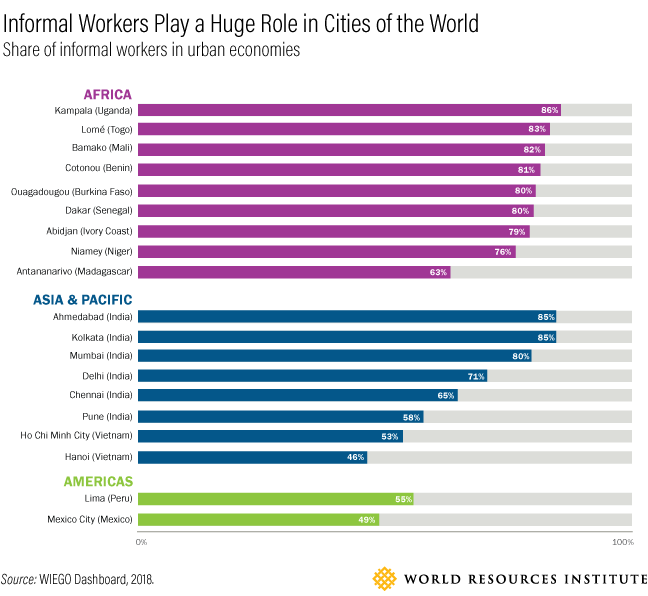 It is time for cities to recognize and value the contribution of informal workers. If cities aspire to increase economic productivity, the way forward is to include informal workers in the formal processes and institutions of urban governance, planning and finance. Know about an initiative that has transformed a city to create positive environmental, social or economic ripple effects? Help take it to the next level with a $250,000 Ross Prize for Cities. Submissions close June 30th, 2018. Learn more here. Instead, informal workers are often stigmatized and penalized for simply trying to earn a living. Everyone depends on the informal economy in some way, either directly or indirectly through its linkages with the formal economy. Yet, cities continue to ignore the clear majority of the working poor in the informal economy, who face harassment, including evictions from their homes and workplaces and confiscation of their goods. Rattana Chalermchai works with her husband, Mongkol, at home. A former factory worker, Rattana was laid off during the economic crisis in 1997. She now supplies hand-made flip-flops to a resort. She and her husband are long-time members of HomeNet Thailand, and have contributed to several policy campaigns for informal workers, including the Universal Healthcare Coverage. Through HomeNet, they have also helped Thailand’s home-based garment workers to officially register themselves as a garment cooperative. As legal entity, the cooperative has broadened opportunities to get work orders, and more importantly, strengthen a movement of home-based workers. (Photo by Paula Bronstein/Getty Images Reportage). In the new World Resources Report paper, we focused on three types of informal workers—home-based workers, street vendors and waste pickers—who represent a significant share of the urban self-employed who are directly impacted by city policies. The paper highlights several examples of inclusionary policies and practices which have resulted from the successful collaboration between inclusive cities and informal worker organizations. Home-Based Workers in Bangkok, Thailand – An organization of home-based informal workers who produce a range of goods and services from their homes, HomeNet Thailand, convinced relevant government agencies to address the transportation needs of informal workers resettled on the periphery of the city. As a result, the Bangkok Mass Transit Authority (BMTA) approved two additional buses from the resettlement area to a main market area and has promised to build a pedestrian bridge over a dangerous road crossing in the resettlement area. Persistent advocacy work also led to the Homeworkers Protection Act and Domestic Workers Ministerial Regulation, which entitle home-based workers and domestic workers in Thailand to a minimum wage, occupational health and safety protection, and other fundamental labor rights. Street Vendors in Bhubaneshwar, India – City authorities worked with the street vendors’ organization to develop an inclusive model creating 54 dedicated vending zones and approximately 2,600 kiosks for informal street vendors to operate from. Under this arrangement, city residents can continue benefiting from street vendor activities, while the vendors can operate in designated zones without the risk of harassment or confiscation. Bhubaneshwar became one of the first cities in India to acknowledge street vendors as an integral part of the city and designated space for them through a complex public, private and community partnership model. 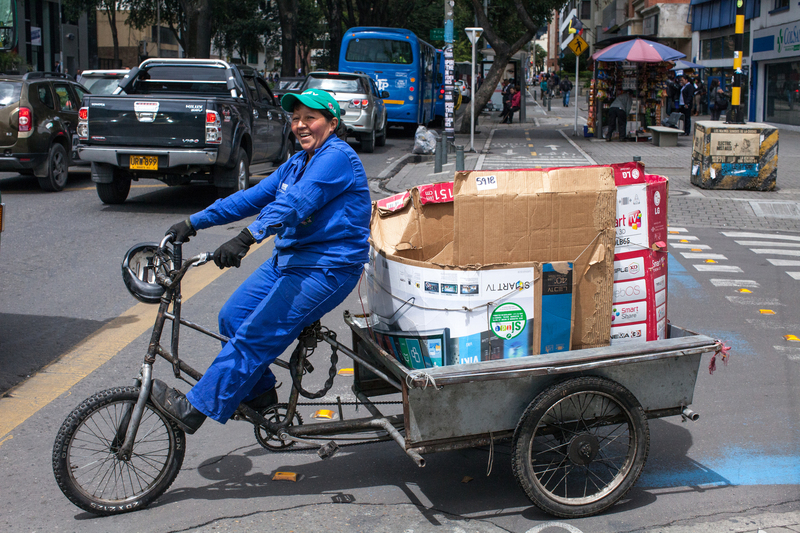 Sonia Janeth Barriga, a waste picker member of Asochapinero—an affiliate of the Asociación de Recicladores de Bogotá (ARB), an organization of waste pickers’ associations and cooperatives that advocates for waste pickers' rights—transports recyclable materials with a tricycle. In this neighbourhood, Chapinero, she has negotiated with building administrators, neighbours, and hotel managers to be able to collect their recyclables. Being part of an organization has been instrumental to her success in these negotiations. (Photo by Juan Arredondo/Reportage by Getty Images). Waste Pickers in Bogota, Colombia – A 2014 national decree ruled that cities across Colombia should develop solid waste management schemes which recognize and pay waste pickers to collect, transport and sort recyclable waste. This was the result of decades of advocacy by waste pickers in Bogota, who convinced the municipal government to pay for their services. Since that ruling, as a result of the joint efforts of the Asociación de Recicladores de Bogotá (ARB) and WIEGO, eight other cities across Colombia are now paying waste pickers for their waste collection and recycling services, which benefit everyone by keeping the streets clean and diverting recyclables from landfills. These cities, and others, have demonstrated that when informal workers are recognized and protected, everyone wins. This requires collaboration among city governments, civic organizations, worker associations and other key stakeholders. Cities need to examine their policies and practices with a view to empowering informal workers. That means first stopping the practices that impact negatively on informal work, such as harassment, evictions, and relocations. Second, in a more positive approach, cities need to actively support informal workers by providing access to public goods and public spaces, social protection and improved services. Finally, and most importantly, they must give informal worker organizations a seat at the policy table. Including the voice of informal workers (and other stakeholders) in the formal processes of urban governance is the best way to negotiate policies and plans that balance competing interests and promote social justice. For cities to be more equal and meet the global commitments to inclusive, fair and sustainable cities in UN’s Sustainable Development Goal 11 and the New Urban Agenda of Habitat III, it is imperative that urban informal workers are recognized, valued and supported.